Brown rice is definitely a much wiser choice than regular rice, since it is loaded with great nutrients, and high in fiber. Rice is rich in naturally occurring oils, which help normalize cholesterol levels. Rice is a gluten free grain and considered a low glycemic index which can stabilize blood sugar. Brown rice can lower the risk for some types of cancer due to it’s minerals and whole grain properties. BROWN RICE IS GOOD FOR YOUR HEART! It is important to rinse the rice thoroughly under running water before cooking, to get rid of dirt and debris. 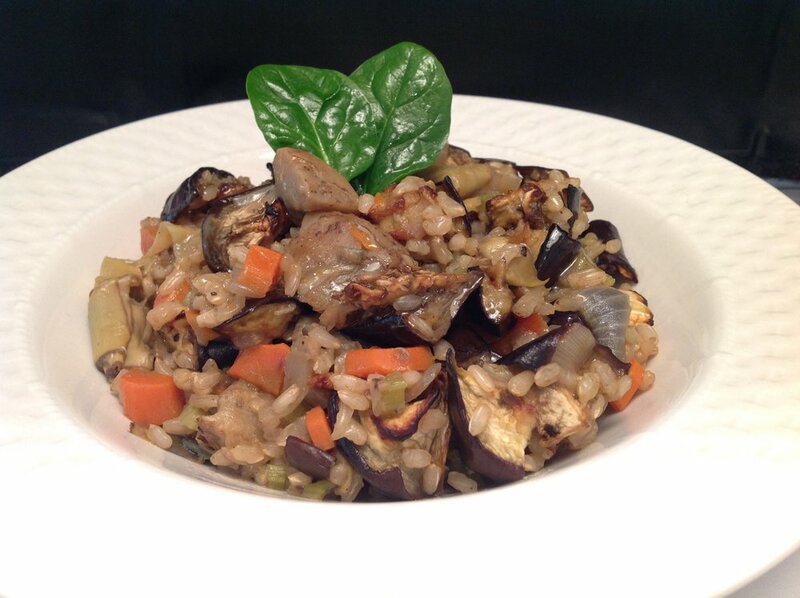 Try this amazing fully-loaded vegetable and brown rice heaven! Pretty easy to make, and it is rich, yet lean, with just a bit olive oil, which is super good for you! Also, it has lots of flavors that go very well together. In a wide pot add olive oil and onion, sauté for a few minutes, then add garlic, salt, pepper, celery and carrots. Sauté for a few more minutes. Then add artichoke hearts, and rice, sauté for couple minutes, add water and vegetable paste. Bring to a boil, and then simmer for about 30 minutes until all the water have evaporated. Add the eggplant, mix and serve.